The most nailbiting thing about Interstellar isn’t one of its very well done action sequences or the twists and turns its plot takes, but how the movie’s wide reaching ambition nearly ends up backfiring on the whole production in the last act. Director Christopher Nolan has been seen by many as a risk taker of sorts, crafting cerebral work; blockbusters that engage the brain with many concepts, and the effects budget to show them. In Interstellar, said ideas and effects are cranked up to eleven, packed into a 169 minute runtime, to the point where it’s almost too much to handle cleanly, and some poorly handled emotional developments in the last act don’t help matters. But there’s still a lot to be said about how someone like Nolan can craft a project like this, which can be called many things, but “unoriginal” certainly wouldn’t be one of them. It’s a cliché to say, but it’s true – many big studio directors would kill to make a movie like this, just once. One of the positives of the screenplay, co-written by Nolan and his brother Jonathan, is how the film, which opens with a bleak diagnosis for Earth, never states what year the action begins or what precisely happened to make things so bad. Many movies, made by less talented filmmakers, would be tempted to start with some canned voiceover (You know, something like “The year was 20[blah-blah], and [so-and-so] happened to make the Earth a barren, empty place.”) That doesn’t happen here. When the movie begins, we meet Cooper (Matthew McConaughey), a former NASA astronaut who, as a result of shrinking resources, increasing population, and the constant risk of crippling famine, is forced to change jobs and become a farmer. His wife is dead, killed because of the difficulty to access basic medical care, by an otherwise treatable cause. He has two children – 15 year old Tom (Timothée Chalamet) and 10 year old Murph (Mackenzie Foy), and lives with his father-in-law Donald (John Lithgow). The region is struck by regular dust storms (comparisons to the Dust Bowl play into much of the action set here), and during one of them, Murph forgets to close her bedroom window. Dust begins to cascade in, falling in an odd pattern to the floor, where it seems like binary digits written in dust have been formed. On a lark, Cooper decides to drive to the location that was decoded, and his daughter sneaks out of the house and joins him. It turns out that it these are coordinates that lead to “the best kept secret in the world” – what’s left of NASA. Led by Professor Brand (Michael Caine), Cooper is informed that his children’s generation will be the last to survive on Earth, and a new planet must be found. He joins the mission, alongside Brand’s daughter (Anne Hathaway), astronauts Romilly (David Gyasi), Doyle (Wes Bentley), and two robots named CASE (voice of Josh Stewart) and TARS (voice of Bill Irwin) to find a habitable planet in another galaxy, by entering a mysteriously formed wormhole near Saturn. Here, one hour of local time equals seven years of Earth time, so via grainy video messages, Cooper watches Tom and Murph grow into adults (now played by Casey Affleck and Jessica Chastain, respectively), unable to communicate back, aging none, trapped in a task with growing danger and seemingly little success. This familial conflict is Interstellar’s main emotional drive; when the kids grow up, the story switches back and forth between outer space and Earth, where much tension stems out of Murph having never forgiven her father for going out on the mission in the middle of her childhood, gone for what feels like forever. This is a component of the film’s climax, at once towering and complex and simple and small. Without spoiling too much, there is a factor of a kind of “…and that one thing is love” in solving the film’s central mystery, which is sometimes handled in a sloppy and forced manner. This is the point where you realize that in trying to hit every note there is, the script has put a little too much on its plate. There’s a degree of irony to a movie that places such an emphasis on the conquering power of love, while it is simultaneously able to build up impossibly detailed foreign worlds and sciences, and be tripped up by drawing general sketches of emotion. In a way, Nolan proves his own point, but not in the way he intended. But let’s not dwell on the negatives forever. The movie looks gorgeous, and perhaps saying just that is an understatement. The blending of practical effects and CGI is seamless, with vast galaxies perfectly combining with the actors onscreen. This is an awe-inspiring and breathtaking visual experience that you need to see on the big screen. Also worth mentioning is the loud and rattling but well mostly designed sound mix, save for a few moments where dialogue is turned too low and action is turned too high. The score, by Hans Zimmer, is a bit different than his boisterous and nearly irritating ubiquitous noise from Inception, which has now become more of a meme than anything else. The music here is subdued, more minimal, with emphasis on the organ for many melodies. When listening to it without an accompanying image, some sort of celestial cathedral begins to form in your mind. Its additions are innumerable. And there is the acting, which is excellent. Matthew McConaughey has proved himself over and over again these past few years. Here, he plays an action scene or an emotional one with equal levels of intensity and dedication. The other big performance is from Jessica Chastain as Murph at mid-adulthood, whose wide range of development registers with spectacular clarity. The supporting cast members, from Hathaway to Caine to Irwin to Mackenzie Foy as Young Murph to Matt Damon in a largely unadvertised but vital role, are great. 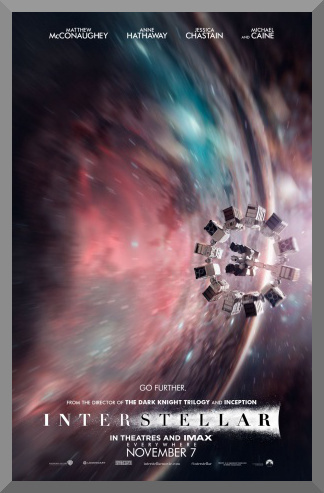 The reason why I have just hit 1,000 word mark in this review, yet did not particularly love the movie I am writing about, is because Interstellar, like most of Christopher Nolan’s movies, is capable of sparking heavy discussion, for better or for worse. And while there are times where the pace drags or the finale exposes the overload of input and the sometimes conflicting mix of levels that the movie has taken on, it doesn’t detract from the film’s interest, which is high and will likely remain so as a heavy point in this director’s career, both from Interstellar’s fans and critics. With its heavy science fiction, a scope that can’t get much bigger (Wormholes! Other galaxies! Dimensions!) and pros and cons to unpack for hours, there’s a lot to this movie. So while Interstellar doesn’t register among my favorite of Nolan’s filmography in terms of total enjoyability, it’s definitely up there in what there is to be seen, and what everybody will individually take away, because make no mistake: issues aside, everybody should still see it.